Yesterday was spent on the computer for most of the day, writing a new pattern for a magazine commission…..
it was hot, so the blinds were drawn and the lemony water was on hand. So now that’s finished, it’s time to turn my thoughts back to Christmas gifting. I’ve designed some new Christmas ornaments which I just L-O-V-E, and I’m stitching them up at the moment. Here’s a quick look……. This close up makes it look like I’m stitching on hessian, but I assure you it’s a beautiful soft linen and you’ll just love these! I wonder if you can guess what they will be? I should finish them this week, set to release the pattern next week, in time for you to be stitching for Christmas. They are quick little decorations but very sweet (if I do say so myself!) Keep an ear open soon. 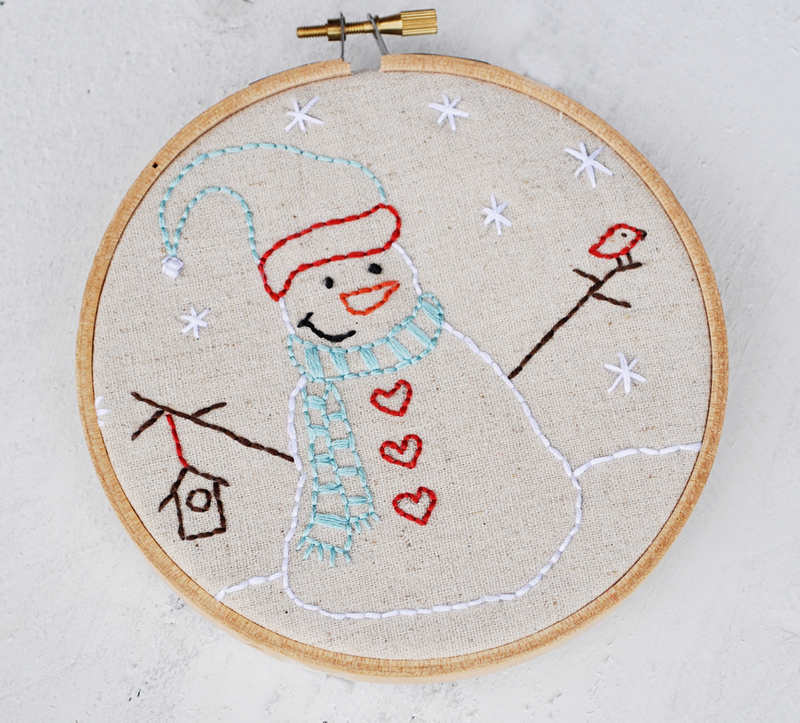 I’ve come across this cute little free snowman stitchery in my bloggy travels and thought I might share it . Would be great as a quick gift for a teacher or friend. Still lots of secret sewing happening but I’m making some big plans for what’s going to be happening in 2015 here in Sugarlane House. All I can say is Watch This Space. IN the meantime, I have definitely made plans to stitch up this gorgeous quilt over the Christmas break, whilst I catch up on old Christmas movies and of course, the tennis! Jenny has just released the last of the blocks today, which you can download as a single pattern, or if you’re like me and have been collecting them week by week and putting them away for ‘a rainy day’, there are individual block patterns. I’m so looking forward to making this, I even have the fabric chosen and put away with the patterns in their folder, waiting patiently for the Christmas holidays. 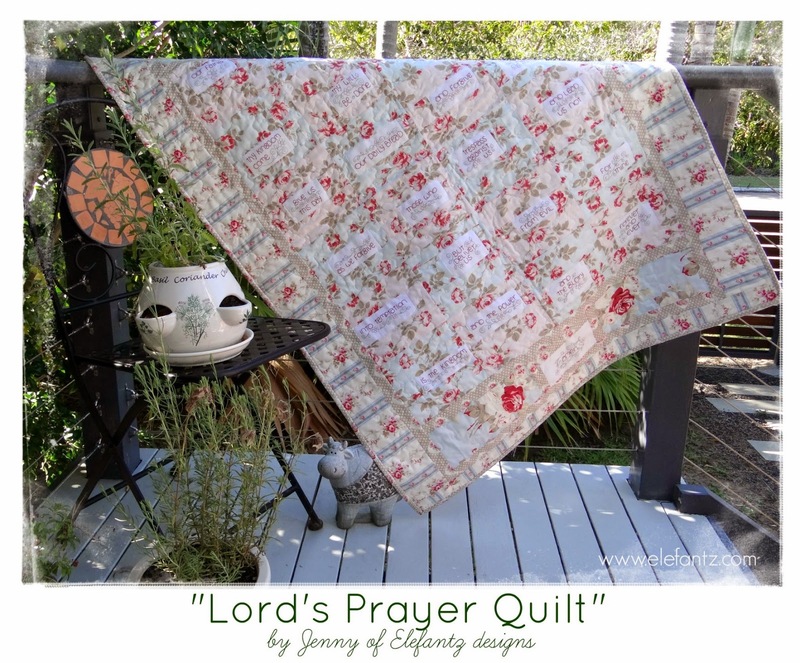 What better time to stitch up the Lord’s Prayer?! You can visit Jen and read about them HERE and then go and visit her Craftsy store to download the forever FREE pattern/s. 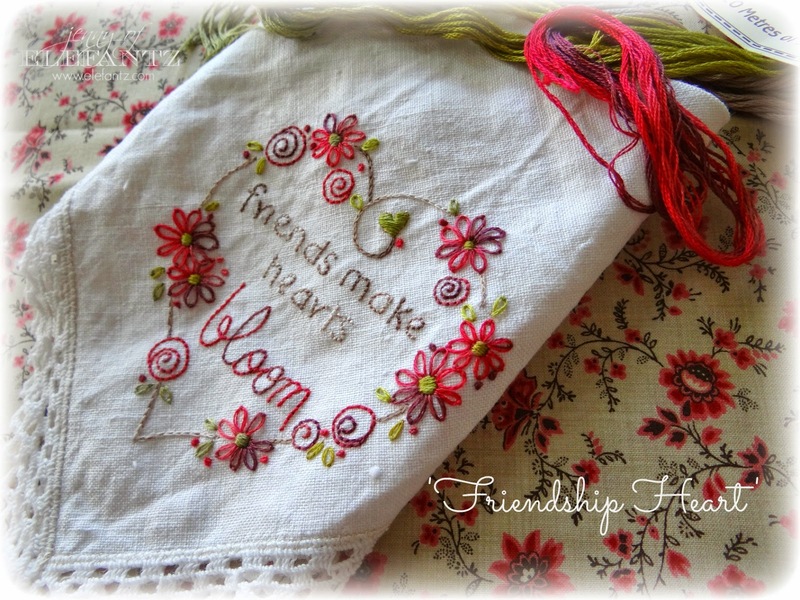 You can also read about her new Stitchery club you’ll want to be a part of….. Here are just a couple of projects from this month I just know she won’t mind I share with you…. just a couple to whet your appetite. Heaven knows, I’m drooling! YOu can either subscribe HERE to receive each month’s patterns automatically, or purchase the month’s you want in Jen’s Craftsy Store . I don’t want to miss a single one so I know which option I’ll be taking! Don’t forget to come back tomorrow for sign-ups for Friday Night Sew In…..the second last for the year….loads of fun, if you’ve never joined in before…….everyone is welcome! Thank you for the snowman link. Amazing to think how little I love snow and how much I love snowmen! LOL Your teasers are intriguing. I'm looking forward to seeing the ornament pattern. 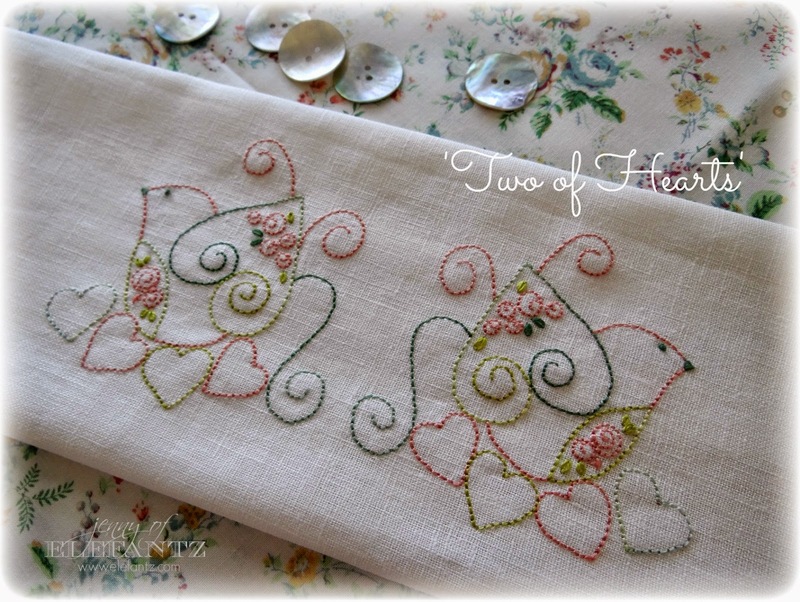 The Two of Hearts was my favorite from this month's wonderful Jenny patterns. You two are so creative. I love the fact that you are also good friends! Beautiful things you're working on & of course your new designs will be gorgeous! 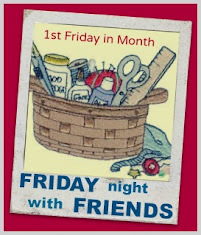 looking forward to seeing what you are designing, and also joining in with the Friday night sewing. Stitchery on linen is a great combo, looking forward to the reveal. Can't wait to see your ornaments, hon!